Specialized in medical aesthetics equipment, Deleo has developed an innovative system to permanently remove localized fatty tissues by a non-invasive technique consisting of cold crystallization. for a while? With all the security that come with certifi ed and approved medical devices? The equipment provided by the French company Deleo is proving to be genuinely revolutionary. 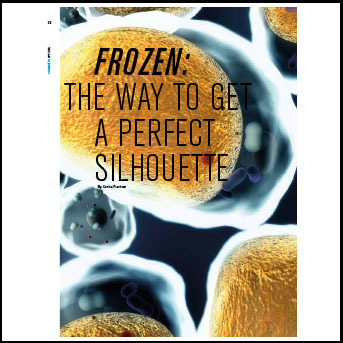 This innovation relies on recent scientifi c discovery: adipocytes or fat cells react to cold in a specifi c way. The device developed by Deleo uses thus cold to crystallize these cells (hence the name Cristal*) which causes their apoptosis or death and prevents their regeneration. Dead cells are discarded naturally through the lymphatic circulation. More specifi cally, the patient’s greasy build up is vacuumed into the cavity of the Cristal device. For about an hour, it will be kept at a temperature of -6°C to -8°C, depending on the area to be treated. All other cells or tissues are left untouched. The fi rst eff ects of the treatment become visible after about a month. It takes two to three months to get the full result, which is permanent, unless of course the patient puts on additional weight. Only qualifi ed doctors, dermatologists, or plastic surgeons are authorized to use the device. The medical asethetics sector is experiencing a boom. “Other, less reliable cryolipolysis systems are currently thriving on the market, mentions Adélie Versepuech, Deleo’s marketing manager. We have opted for a 100% “made in France” production to distinguish ourselves and to guarantee the perfect quality and safety of our products. They are entirely designed and manufactured in our Saint-Rafaël factory in the French Var department.” Total control of the supply chain enables Deleo to guarantee total traceability and security to its customers. It also helps innovation. “We have just launched a new device Agate, designed to treat small areas, such as the chin, the arms, the knees and the chest. adds Adélie Versepuech. It is fi tted with area-specifi c applicators, which is unique in the market and helps to obtain the best possible results”. Agate uses a patented technology ensuring a targeted and even distribution of cold, which was a real technical challenge. This strategy has been successful for the French company. After only six years in the business, their products are distributed on a growing number of markets: Europe, the Maghreb, Qatar, Indonesia … Russia and the USA will be next. * Deleo has decided to fit their device with a LEMO-NORTHWIRE complete cable-connector solution, made to measure in only two months.